This beautiful Straight Bar with side Zirconia stones mothers ring, can be customized to fit your desires. This beautiful Mothers ring, mom ring, nana ring, can be customized to fit your desires. This ring is available in Sterling Silver, 10k white gold. 10k yellow gold, 10k rose gold, 14k white gold, 14K Yellow Gold, or 14K Rose Gold. Each birthstone measures 3.0mm. Gold options allow you to select CZ or Diamond side stones as well. This ring contains up to six 3 mm birthstones, and up to 10 2.0mm side stones. The weight of this ring ranges from 5.15 grams to 5.85 grams depending on the number of birthstones selected. 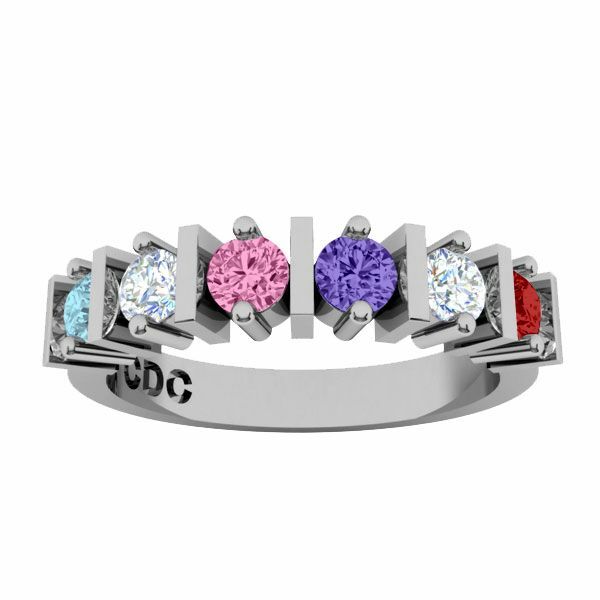 Gift her This Ultimate Straight Bar with side CZs Mother Birthstone Ring, Mom Birthstone Ring, Mom Ring, Nana Ring, to show her that she is special and loved!